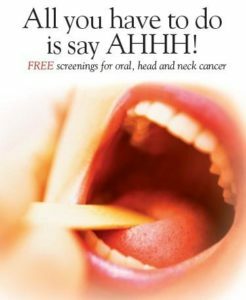 Throughout the month of April, East Madison Dental will be offering free oral cancer screenings in their office in Tenafly, NJ. They will also be hosting oral screenings at local venues throughout Cresskill and Tenafly (locations and dates TBA). Free Oral Cancer Screenings offered to the public during regular business hours in April. Please call for an appointment. The Smile Center of Wrightstown, 561 Monmouth Rd. Free Oral Cancer Screenings open to the public during regular business hours in April. Please call for an appointment. 609-758-2244. Complimentary oral cancer screenings using the latest fluorescence technology. Event runs all April long during regular office hours.